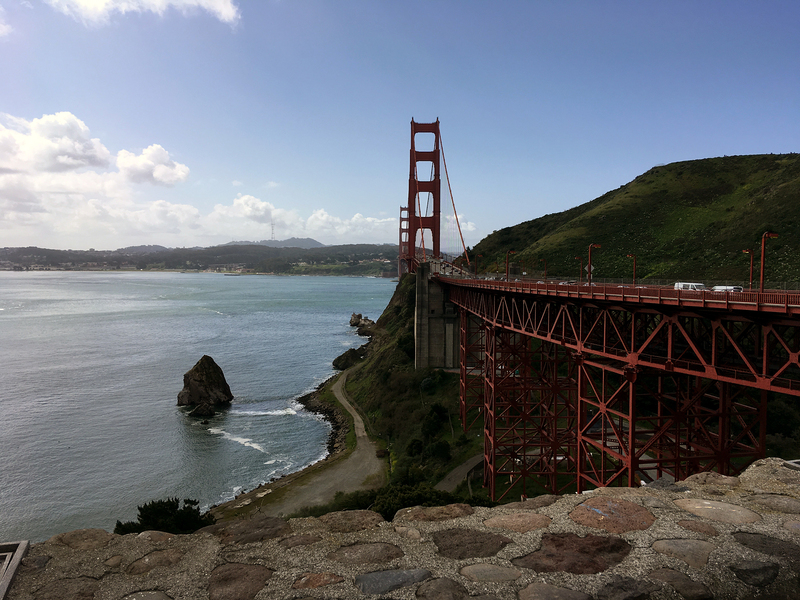 Slept beside the Golden Gate Bridge in San Francisco before driving through the towering Redwoods of Northern California. We were officially out of the endless summer that California is so known for and on our way north. With a free day and a full tank of very expensive gas, we took a cruise around San Jose and Silicon Valley. Wanting to check out the new Apple Park, we may or may not have tried to drive into the trippy loop through the employees only entrance before getting stopped by security. I don’t think many Apple employees come to work in an ’84 Dodge van so our tour was pretty limited to a drive around the loop where Priuses and Segways ran wild. We did a lap around the other tech offices in the area before it started to pour and we headed for San Francisco. 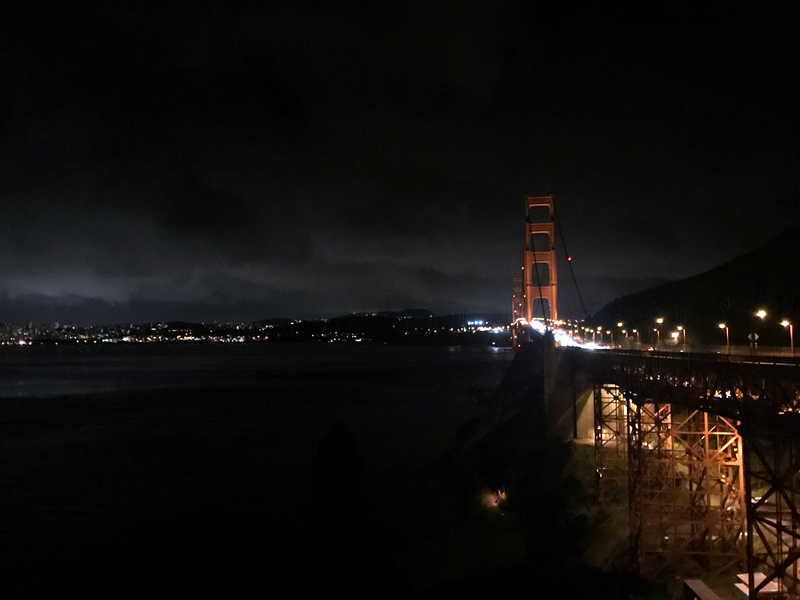 Not the most ideal evening to sit in the park and pretend you’re on Full House, so we just drove across the Golden Gate Bridge and found our spot for the night at the rest area on the Marin side. Staying at rest areas is usually a last resort for us, but this one has the most spectacular view of the city and bridge (and Alcatraz!). There’s also a Northern California recreation area on this side that offers sites for tenters with a free reservation. We woke up to busloads of tourists coming to snap their photos and a sunny view of that bridge we’ve all heard so much about. 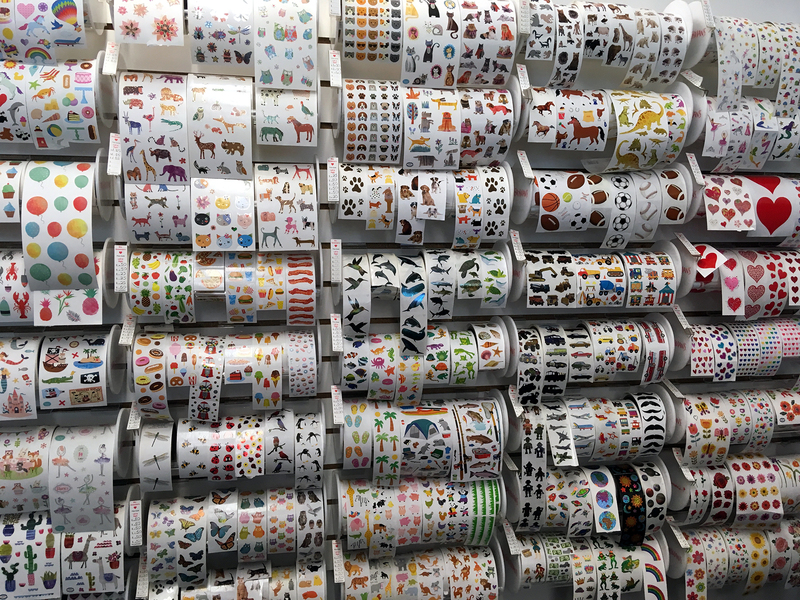 We ended up chatting with a bunch of other vehicle dwellers before heading on to Petaluma where we got to tour a sticker factory! Travelling through the country has allowed us to link up with lots of friends and people we’ve worked with that we never thought we’d get to see, which is really rad. 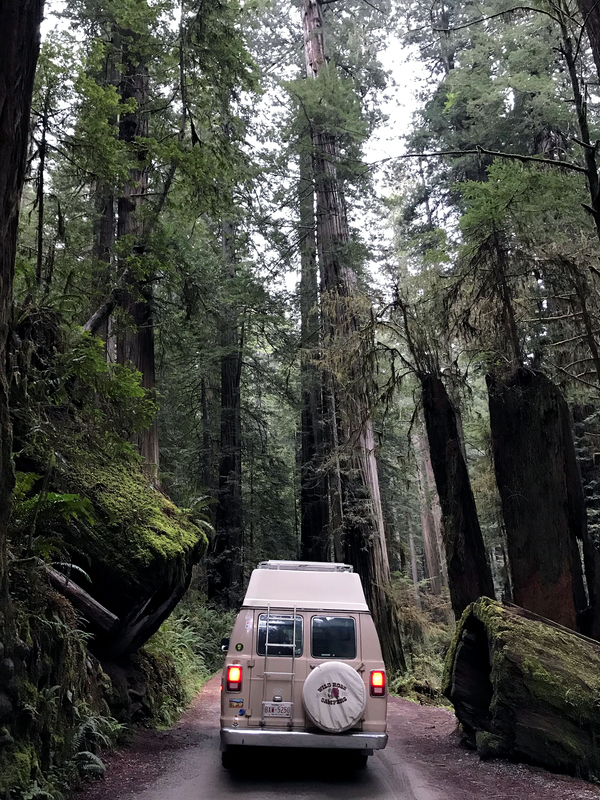 Taking in all of the delicious grapey smells of Sonoma County, we spent a couple days camping among peaceful forests and waterfalls before venturing into the grandfather of all trees, the Redwoods. We saw a sign along the 101 highway mentioning a “drive-thru tree”. 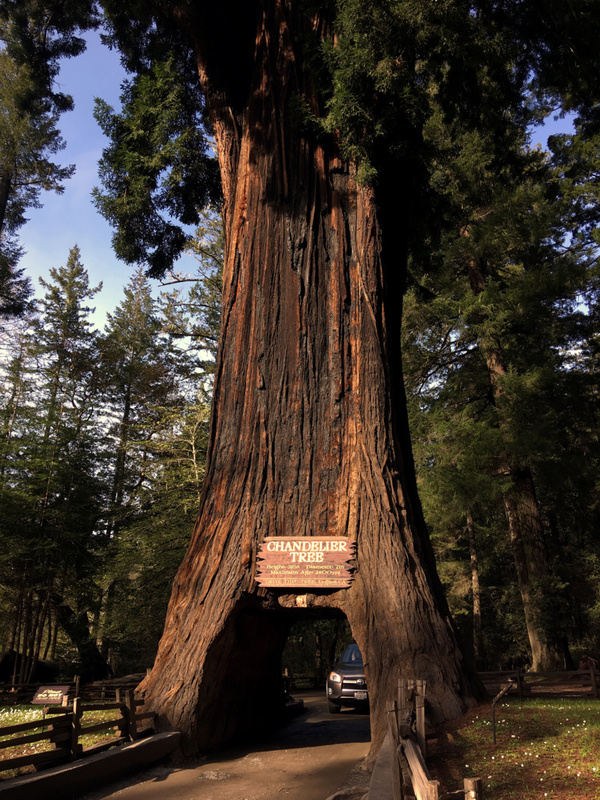 Intrigued, we followed the signs and ended up in Leggett where, for 5 bucks, you can drive through a massive 2400 year old tree – if you’ve got a compact enough car. Sadly, Clementine is a full-figured girl so we walked through instead but it was still really crazy and really cool. You can see all the marks along the sides of the little tunnel where people have realized they’re too big to fit and continued to scrape on through. 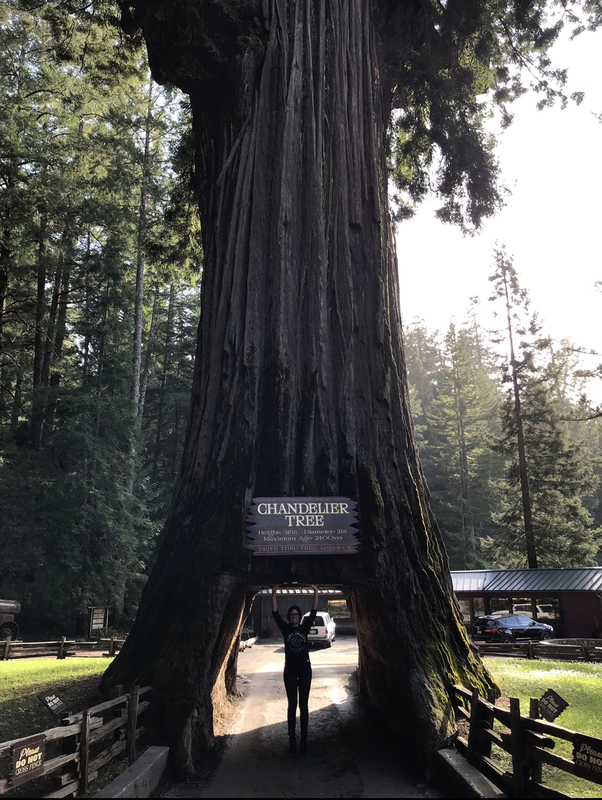 The tree itself is called Chandelier Tree and is older than Jesus! Think about it! 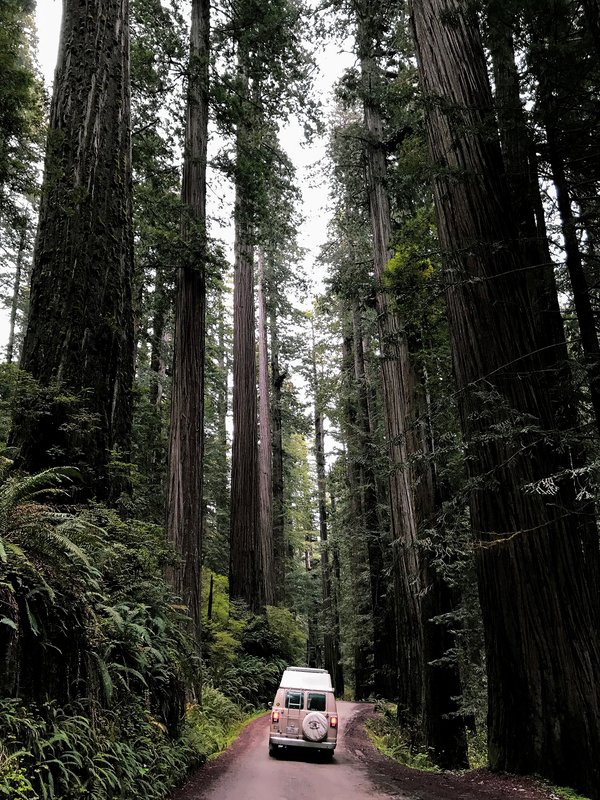 Being amongst these huge sequoias in the Redwood Forests is incredibly humbling and serene. To think that these giants have been around through so much, from the medieval days to the World Wars, makes all your minute problems seem pretty insignificant. It’s a similar feeling that I get in the mountains where you realize that things that might seem so important right now are really just another ring on the tree or a rock on the mountain. If these trees could talk, I’m sure they’d have plenty of wise words to say. 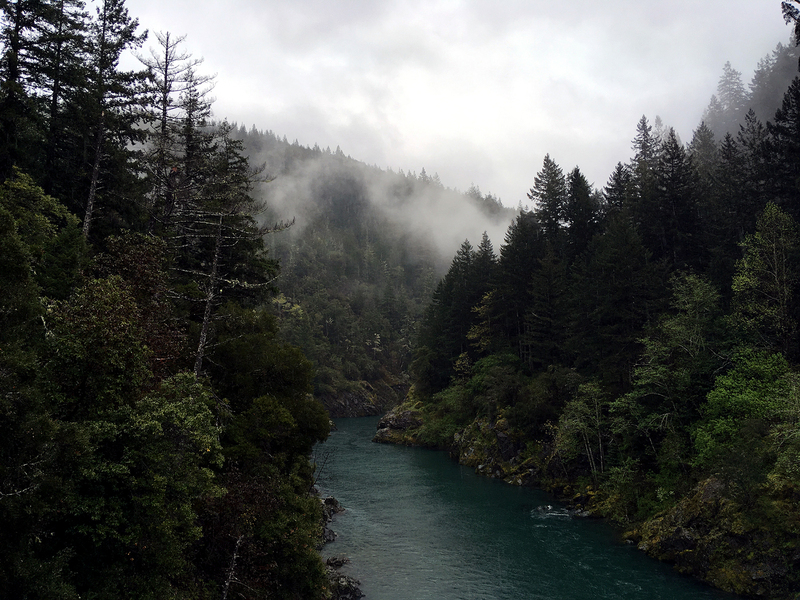 There are a variety of enormously treed forests amongst the Redwood National and State Parks that all have different hikes and scenic drives to offer, but our favourite was the Jedediah Smith State Park near Hiouchi. Take the Howland Hill Road scenic route and feel so small in the jungle of trees. I probably have more photos on my camera roll of this drive than any other because it would not cease to keep blowing my mind. I’ve said it a hundred times now but these trees are just so damn big!! When these monsters fall, there’s no chance you’re moving ’em so instead, you get to drive through them! As expensive as the gas is and as saturated as the van scene may be, California is undoubtedly a magical place and I completely understand why so many people live there (fun fact: the population of California is greater than the entire population of Canada). It’s got such a diverse landscape and really does have something for everyone. Because we only had two weeks to explore it with the clocks on our visas ticking, we decided to stick to the coast and leave the interior for next time. We cannot wait to venture back and explore Death Valley, the Sierras and everything in between.